60 June/July 2018 unmanned systems inside AIR DESIGN T he free 3-D aircraft de- sign software package known as MachUp was developed to help drone startup companies and university researchers design un- manned aircraft. Now MachUp has received major new upgrades that en- able it to design aircraft with rotors and electric motors. With MachUp, users do not have to download the kind of sophisticated computer tools that are often required nowadays to design aircraft, including drones. MachUp is a web-based soft- ware that works on any browser and on any platform, including smartphones and tablets. MachUp is available free at http://aero.go.usu.edu. "The aim is to not have any real limits in terms of what users want to design," said MachUp developer Doug Hunsaker, an assistant professor of mechanical and aerospace engineer- ing at Utah State University. By giving users a great deal of free- dom in what they can design, Hunsaker's aim is to help people create drones for the wide variety of applications that un- manned aircraft might have in the future. "The only real limit with MachUp is speed, because the computations as- Image courtesy of Josh Goates. 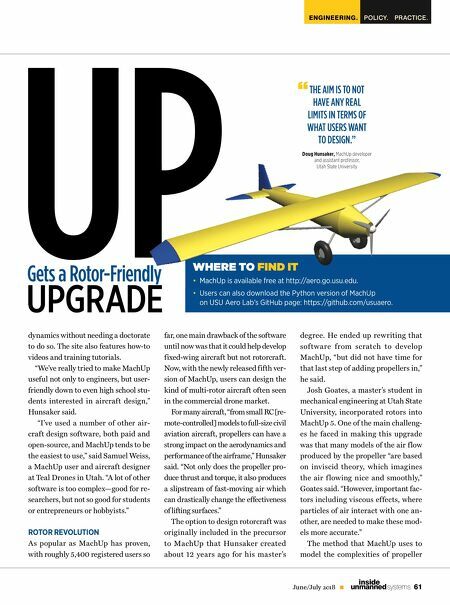 The free MachUp drone design software can now be used to also design rotorcraft and incorporate electric motors as well as craft fixed-wing drones. by Charles Q. Choi sume an incompressible f low of air," Hunsaker said. "That limits the air- craft that one can build with MachUp to f lying less than a third of the speed of sound, but everyday drones do not f ly anywhere near that fast." Hunsaker's aerospace and computer software credentials stem from industry experience. Before his current academic position, he was a design engineer for Scaled Composites, the California firm behind Virgin Galactic's SpaceShipTwo suborbital spaceplane. In addition, Hunsaker was co-founder and CEO of Utah-based Blucraft, which provided web-based computational tools to the aerospace industry designed to quickly analyze and optimize airframe designs. 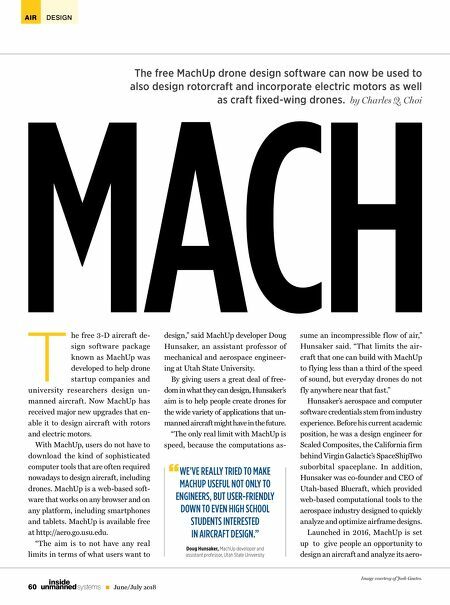 Launched in 2016, MachUp is set up to give people an opportunity to design an aircraft and analyze its aero- MACH WE'VE REALLY TRIED TO MAKE MACHUP USEFUL NOT ONLY TO ENGINEERS, BUT USER-FRIENDLY DOWN TO EVEN HIGH SCHOOL STUDENTS INTERESTED IN AIRCRAFT DESIGN." Doug Hunsaker, MachUp developer and assistant professor, Utah State University "